Instagram is by far my favourite social media network hands down. I use it daily, whether it be for sharing my own photos, snapping Instagram stories, browsing the feed or lusting over new things to buy the house. I could literally spend hours on there. 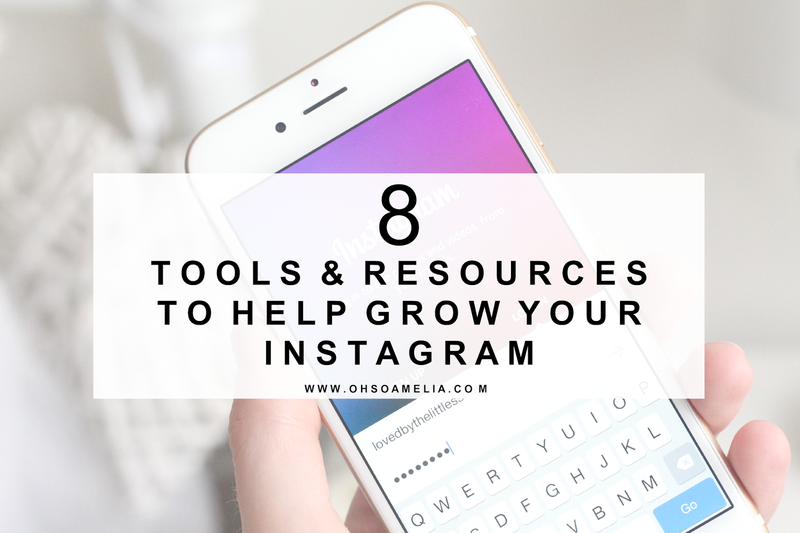 I often get emails and messages asking which editing apps I use so I thought it would be a good idea to share some of my favourite Instagram tools and apps which have helped me grow my account. I've used many different photo editing apps to edit my Instagram images over the years but the one I have been using for the longest and use pretty much to touch up all of my images is Pic Tap Go. I love the filters and find it great for making those little adjustments such as brightness, cropping and straightening which means I don't need to use more than one editing app at a time. I also love the fact that it will save your styles so you can quickly go to history or favourites add a filter you created yourself previously without having to do it again and can easily add it to any new images. I use Vibbi for downloading and saving any of my Instagram photos to put into blog posts. This saves me a lot of time and is great for round up posts or for those days where I didn't use my big camera but wish to reuse some of my images. I have used many different websites but find this one the easiest to use. Crowdfire is a great tool to help grow and manage your following on Instagram. I use this app often to tidy up who I follow as it's easier than doing it on Instagram itself. It also allows me to quickly follow other users who I may have similar interests with. My favourite feature is non-followers as it allows me to go through the list and follow any accounts which are no longer relevant or of interest. The copy followers feature is also a great tool to easily follow users who follow Instagram accounts that you specify. Crowdfire is a must have tool for any blogger or business trying to grow their following. I have been using plano.ly for a while now to visually plan out my grid ahead of time. Although I don't use it as often anymore it's still one of my go-to apps. From the app or desktop you can click on any image from you library and drag it to the place you want to be live within your feed, then schedule it in that order. If you're stretched for time then scheduling may be the way forward for you. Often if I have a busy week ahead I like to schedule a few posts throughout the week. These are usually only brand collaborations as I tend to post in the moment for the majority of my images. But I have found this tool really useful over the years. Although it doesn't automatically publish the image for you, you will recieve a notification at the scheduled time to publish it and you simply click ok. This saves a lot of time instead of having to write up the text and hashtags. Did you know that you can create keyboard shortcuts for Instagram on your iPhone? It's so easy and you'll wish that you had known sooner. This saves me a lot of time instead of having to write out the hashtags each time. Simply go to settings>general>keyboard>shortcuts and then add in all the hashtags you wish to use. You can put them in specific categories and name them accordingly if for example you use different hashtags for different photos often. For example if I type the word "igkids" it will automatically complete with all of the hashtags I like to use and included in the shortcut. I have many different keywords that auto update including food, fitness, photography, home interiors, Christmas. What ever it may be it saves me so much time and hassle! If you need some hashtag ideas check out Hashtap. Snapwidget is a free tool which allows you to embed an Instagram feed onto your bog and display it as a slideshow, gallery or photomap. If you scroll down to the bottom of this blog you can see mine, I really like it there but you will often see many blogs have theirs in the sidebar. It's a great way to give your readers a little insight into your life and they are more likely to click through and take a look than click on the little social button. Snapwidget updates daily but pulling the latest images from your account. This is a pretty new app compared to others but is really cool. You use it within the Instagram app so you don't need to use a separate gif maker and can create a moving gif that loops back and forth and share them with your friends and followers. So there you have it. My favourite tools, apps and other handy Instagram resources that I use on a weekly and sometimes daily basis. Hopefully you will find some of these helpful to up your Insta-game! What are your favourite Instagram tools to use? Leave them below so we can all check them out! Wow this is life changing. I am off to download Pic Tap Go. I have been using Afterlight up until now.